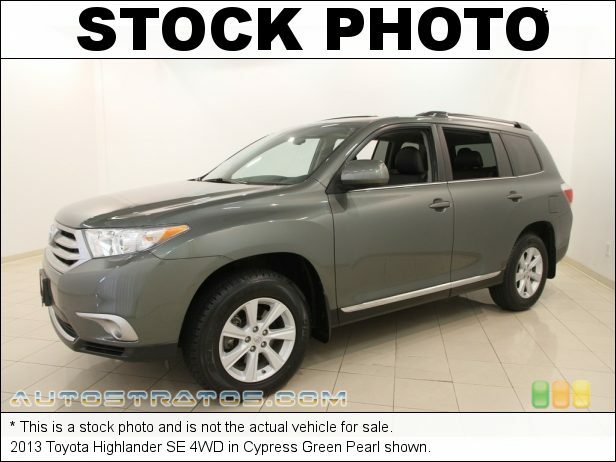 The ideal size for an active family, our 2013 Toyota Highlander Plus 4WD displayed in Sizzling Crimson Mica is perfect for you. Powered by a proven 3.5 Liter V6 that offers 270hp coupled with a smooth shifting 5 Speed Automatic transmission. This Four Wheel Drive attains nearly 22mpg on the open road while providing a smooth ride with great handling, tons of space and sure-footed maneuverability. Indeed, our Highlander Plus has the functionality of a big SUV but has been meticulously crafted to stand out in its class. Its profile is lower to the ground and is accented by fog-lights and roof rails. The interior's instrument panel is easy to use, and you'll appreciate a rear view camera and driver seat power lumbar support. Bluetooth phone/audio connectivity, a sound system with an iPod/USB interface, tons of storage cubbies and a power lift gate are all convenient features for a busy family. Of course, Toyota engineers have exemplary safety in mind with multiple airbags, anti-lock brakes, traction and stability control, a backup camera and a tire-pressure monitoring system. Make our eager Highlander part of your family. Print this page and call us Now... We Know You Will Enjoy Your Test Drive Towards Ownership!